Even if Samsung branches in some countries would like to keep it so*, it's no secret that some Note 7 devices have been sold with a faulty battery and can catch on fire and even explode while charging or shortly thereafter. Samsung plans to replace all the devices sold to ensure our safety even though particular procedure is not always clear (in some countries, anyway). But it will definitely take a few weeks to replace those batteries and deliver everything so what can and should you do meanwhile? First of all, if you can, simply do not use the device at all. It's definitely the safest even though I'm pretty sure Samsung would replace it for you even it's caught on fire. Just turn it off, put it into the box, and wait for replacement. Samsung will probably appreciate its unused condition when refurbishing and restocking. Second, if you still want to use it, make sure it does't overheat. Don't charge overnight, don't leave unattended while charging, don't Gear VR, don't do anything that can make it hot. When charging, keep it close to your body (like, in hand) and quickly unplug if you feel it getting hot. Probability of ending up with a faulty device is low to begin with and with measures like these you can minimize probability of anything fatal even further. Third, you can get creative. 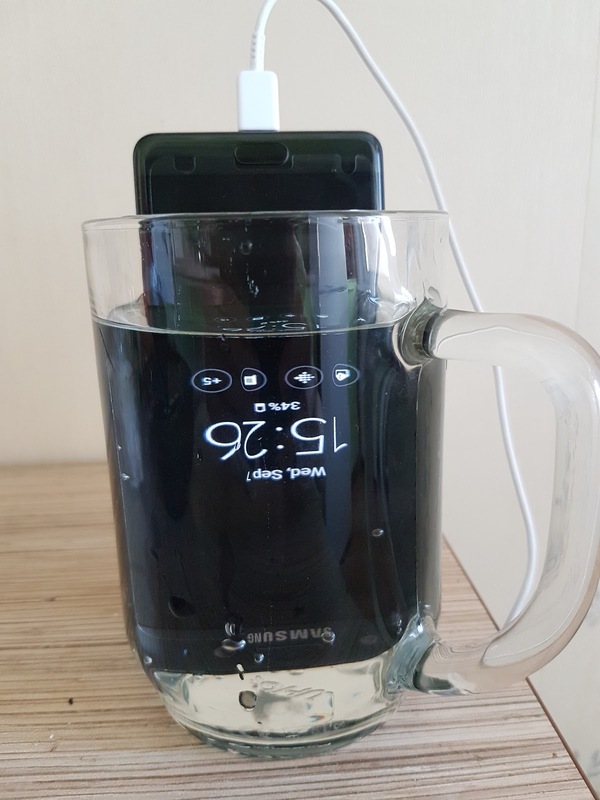 You can tremendously enhance your safety when charging Note 7 if you put it into a glass of ice water. Phone is water-resistant so why not use that? It will cool it off if it gets hot and even if it catches on fire or explodes, water will not allow fire to spread. There is some possibility of short-circuiting so still be careful. Make sure to keep USB port dry as it will refuse to charge otherwise. Leave phone in water for a few minutes after unplugging to make sure it does not explode and, after charging, wipe it dry with a paper towel. * Samsung Russia is yet to publish any news about this even though mass-texting and follow-up calls did happen. Disclaimer: Information in this post is not endorsed or sponsored or approved in any way by Samsung or any of its subsidiaries or partners and represents only author's personal opinion on subject. Use any advice on your own risk, some actions can void your warranty or put you in danger.